Entry Fee for early bird participants are only $15 through April 5! Register early! Early bird rate for students with ID is $5. On the day of the event, fees will increase to $25. Regular prices increases to $20 from April 6th through April 10th! Are you ready to transform your idea into a profitable business? Ready to take your start-up to the next level? 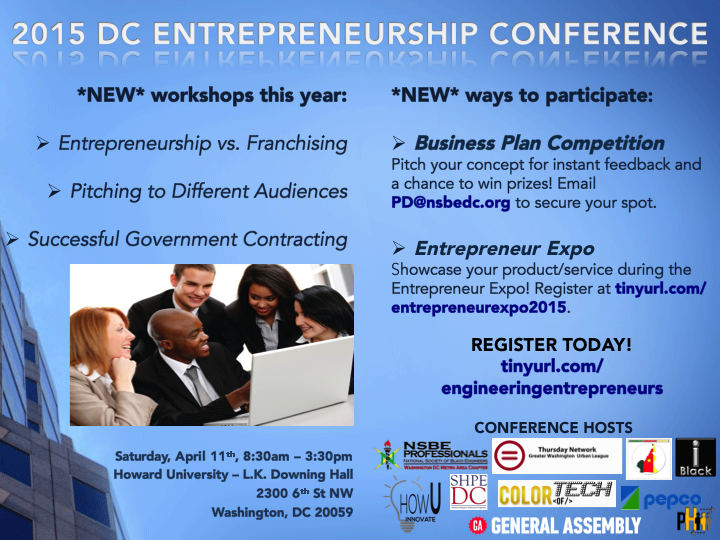 Then join us for a day of interactive workshops and plenty of networking opportunities with DC's premier entrepreneurs! 1. Business Plan Competition: Pitch your concept for instant feedback and a chance to win prizes! 2. Entrepreneur Expo: Showcase your product/service during the Entrepreneur Expo! Email PD@nsbedc.org for details on the Competition and Expo! HURRY, PRICES INCREASE AFTER SUNDAY, APRIL 5TH! Angel Rich, CEO, The Wealth Factory, Inc.
1:00 pm: BUSINESS PLAN COMPETITION - contestants have five minutes to pitch their business idea using a Business Model Canvas. Afterwards, judges will have five minutes to ask questions. Marcus Finley, Senior Solutions Provider, Clearly Innovative, Inc. Copyright © 2016 National Society of Black Engineers Professionals, Washington DC Metro Area Chapter. All Rights Reserved.